I adore Big Sur. It is my favorite place on earth. There is just something magical and mysterious about Big Sur and our 4 and 9 year olds agree! Our family trips to Big Sur are always a lot of fun. Our boys have a fantastic time every time we go. This was a little surprising to me and my wife as most kids aren’t much for site seeing but there is just something about Big Sur that is so captivating if you’re 8 years old or 80. That’s just testimonial to the magic of Big Sur California! The old saying “Big Sur is not a place but a state of mind” is completely accurate! Go to Big Sur and just clear your mind and take in what Big Sur has to offer. Do not go with the goal of “seeing everything”. Just relax into the state of mind that is known as Big Sur. I know Big Sur quite well because I spent the better part of 2.5 years trying to capture her essence on film and I enjoyed every moment of it! I have been up and down Highway 1 coastal Big Sur too many times to count and have my favorite spots. My family loves these spots and I think you will too! Like I mentioned above, don’t try to do and see everything. You won’t get what Big Sur is all about. Just hand pick a few spots and let the rest of the day flow. Take your time, take it in, clear your mind, and relax. 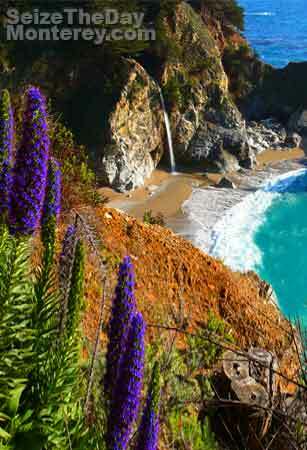 You’ll surely see why Big Sur is world famous and why it is just a magical place to be at! Our 4 and 9 Year Olds Love Mcway Falls! The Crown Jewel of Big Sur California! 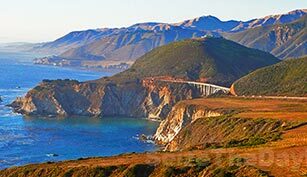 Stop at Bixby Bridge, it is a sight to behold with the melding of the Big Sur coastline and all of her glory with the innovation and engineering of a man-made bride. Pull over into parking lot and get out and take a look. A little deeper into Big Sur, but worth the approximate 1 hour drive from Monterey, not to mention everything you get to experience on the way out. Mcway Falls is simply breathtaking and the hike to it is not even 5 minutes from the Parking Lot. If you only stop and see one thing in Big Sur California, make sure it’s Mcway Falls. You will not regret it. 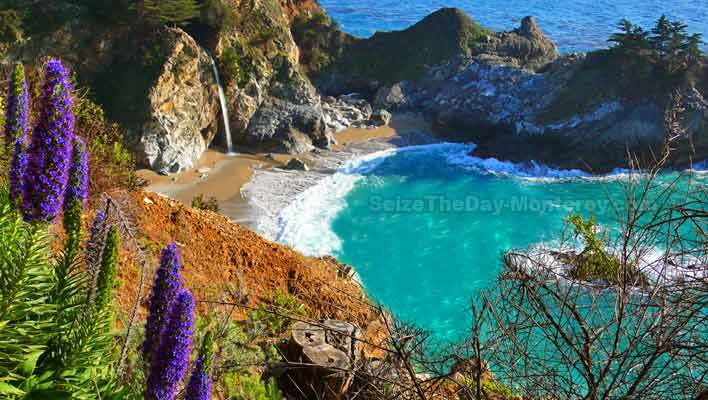 Matter of fact you may regret not stopping at McWay Falls as you can tell from the pictures. It is like something from a movie or postcard!!! You will not be disappointed. Many proposals are done here as well as weddings!!! 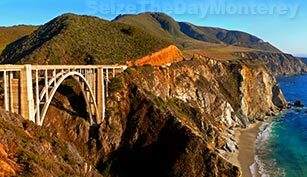 After seeing Bixby Bridge up close, your next stop should be Hurricane Point just 2-3 minutes South from the Bixby Bridge. It is called Hurricane Point for a reason, it’s windy as heck here, but the view is tremendous. On clear days you can see the Point Sur Lighthouse. 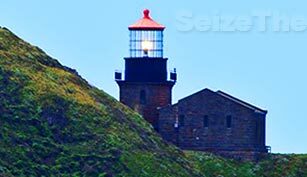 After admiring the view of the Bixby Bridge, just walk a few yards the other direction and you’ll get a sneak peak at Point Sur Lighthouse. It looks close, but the road is windy and it will take a good 5-8 minutes to get to it, but the views along the way of Point Sur are breathtaking. It’s the only Big Sur Lighthouse. 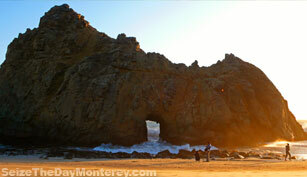 Pfeiffer Beach is probably one of the most breath taking beaches in all of Monterey. You simply feel small when you’re there with grand rocks and mountains meeting the surf beachway. Pfeiffer Beach is one of Big Sur’s best kept secrets mostly because it’s easy to miss the unmarked turnout off of Highway 1. Don’t miss this Gem! 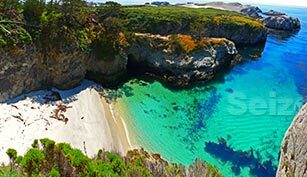 Big Sur Beaches You Cannot Miss! Don’t let Big Sur’s rugged looks and remote location deceive you. Big Sur lodging is quite accommodating and comfortable. 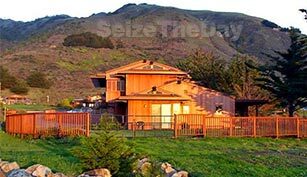 Be aware though that lodging in Big Sur is rustic ans quaint on the cheaper side and luxurious and full service accommodations on the super expensive side. 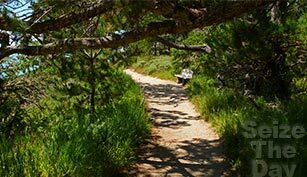 Do not miss and I repeat, do not miss Point Lobos when you’re in the Monterey and Big Sur area. 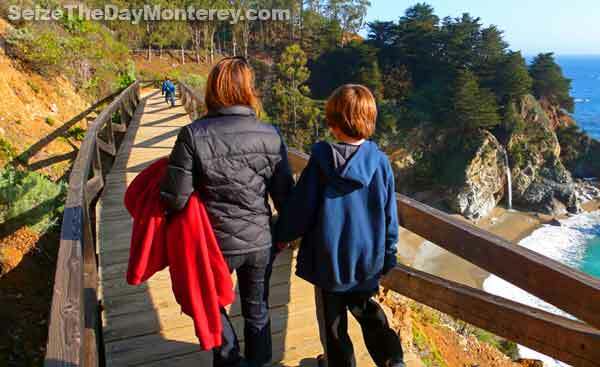 Set aside at least 2 hours to explore one of the most gorgeous areas in all of Monterey County. 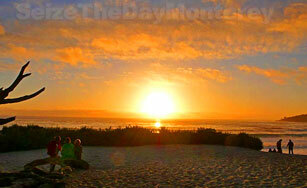 The only thing that could possibly top Big Sur herself, is a Big Sur Sunset! There are a number of choice spots to witness this daily miracle. 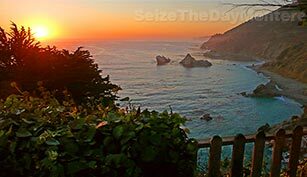 Mcway Falls and Pfeiffer Beach are probably two of the most stunning places to take in a Big Sur sunset. 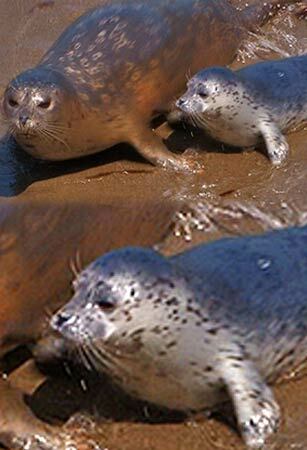 If you’re in the Monterey, Big Sur California area in April, don’t miss the Seals Pupping at Point Lobos. You’ll get to see the bond between Mother and Child in a completely natural setting. Priceless. If you only plan on spending 1-2 hours in Big Sur, then Garrapata should be on your list. 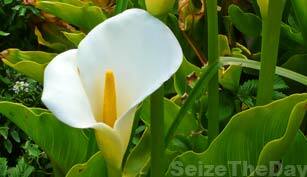 Garrapata has great hikes, a spectacular State Beach, and a creek that blossoms Callillilies as far as the eye can see depending on the time of year. All this Glorious Big Sur sightseeing will give you an appetite like you wouldn’t believe. And believe it when I say there are Big Sur Restaurants that have food to compliment the breathtaking coastline. Nepenthe is one of the most popular spots to dine in Big Sur California, but it’s not the only one. Taking in Big Sur will get your appetite going. 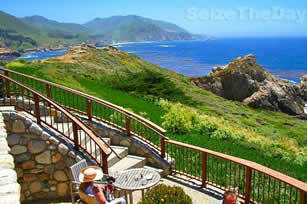 Fortunately a great place to eat that is only about 15 minutes from Bixby Bridge is the Big Sur River Inn Restaurant. 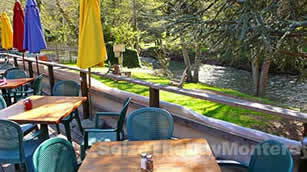 Grab lunch or dinner on the patio which overlooks, you guessed it, the Big Sur River. 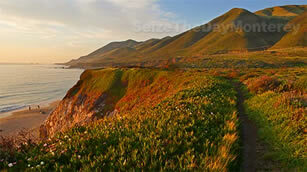 Big Sur is well known as a tremendous place to do some hiking. From quick 5 minute hikes that bring you to breathtaking waterfalls to 5 hour hikes in Garrapata State Park that take you to mountain peeks. And everything in-between, Big Sur has you covered! 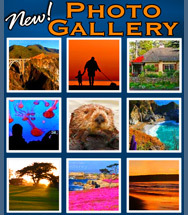 Check out www.HikingInBigSur.com for the best Big Sur Hiking web site on the planet! 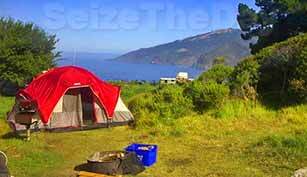 Are you coming to Big Sur California to do some camping? As you may already know, you’ve picked a great place. Big Sur camping is the perfect way to get intimate with Big Sur and all of her glory. Whether you’re roughing it Tent Style, Need a quiet Cabin near a river, or just an RV Hookup, check out our Big Sur Camping section. Pfeiffer Big Sur SP (State Park) has a lot to offer the day visitor as well as the overnighter. From easy to challenging hikes to Waterfalls and Bluffs through Redwoods to fantastic Big Sur accommodations at the in-park Big Sur Lodge. No ocean views here but guess what, they have a swimming pool! 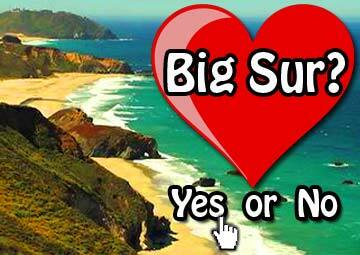 Help me help others enjoy Big Sur to the fullest! 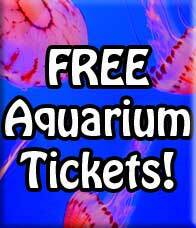 Or just leave a quick comment below!!! Thanks so much for your work and help! We have recently moved here and already I wish I’d seen your website earlier!! My son is looking for a good redwood old growth spot, wondered what would be the best in your opinion? Big Basin was what I found, however, he wants to know if there is anything here? Now I am trying to find pier 2 for Monterey beach parking!!! Thank you for the compliment. It means a great deal to me and my family! Take care! Thank you sooooo much for the kind words. Hope your Highway 1 Drive is a memorable one!!! Thank you soooo much for posting this info! You outlined it in a very helpful way. and really enjoying your content. Keep up the great writing!